Wagon wheels have driven the spread of civilization. From the war chariots of the countries around the Mediterranean to the movement of European settlers across the United States, wheels have increased the mobility of various cultures throughout the world. Sometimes they are old and rusty, sometimes made of chunks of log, sometimes they are beautifully crafted and painted in brilliant colors, but they all help people move from one place to another. It is no accident that wheels are often referred to as “Wheels of Fortune” and not just in reference to the television show. If you pick up a Tarot deck, fortune is depicted as a wheel that can either uplift or grind the querent beneath its tread. When creating decorations, the wooden iron-rimmed wheels that were the underpinnings of Conestoga wagons, chuck wagons and just plain farm wagons are the most often displayed as decoration. Symbolic of a brief twenty-year culture that has inspired imaginations ever since, these wagon wheels invoke images of wagon train masters shouting, “Wagons, HO!” They also invoke images of broken axels, lone wheels lying in the grass of Kansas or on the salt plains of Utah, mute testimonials to the frailty of human endeavor, and to human short-sightedness. Wheels enabled the nomads of the steppes to take their homes with them. They were the underpinnings for the Romany, those roaming tribes that moved goods, provided wandering skills to the pre-motorized societies of Europe. Those wheels were often brightly decorated, but no less fraught with inspiration and tragedy. Modern technology has made nomads of us all, traveling from one job to another, always seeking a better life. Is it any wonder we refer to a new car or truck as our “new set of wheels”? Wagon wheel decorations are both a reminder and a promise of the ways that technology changes our world. Or sometimes they are just a nifty way to decorate in a specific style. Whether authentic antiques or wood, metal or plastic replicas, wheels are a symbol of mobility, both nostalgic and modern. Check out the selections of wagon wheel decorations that follow. Most of them are primarily reminiscent of the American westward expansion, but the tapestry is a reminder that beautiful wheels are not exclusively the property of the spread of Europeans across a country that seemed to them to be endless and unclaimed. 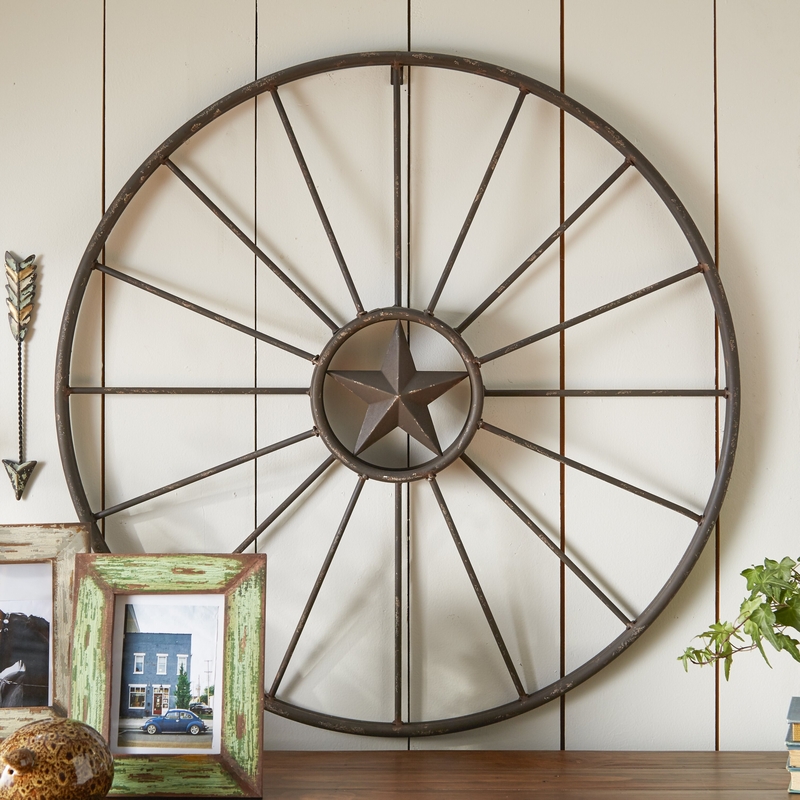 Dress up your country or wild west décor with an old style rusty wagon wheel with a star at the center of the spoke. Invoke national memories of westward moving Conestoga wagons, or a sea of tossing cattle horns accompanied by the steady movement of a chuck wagon traveling from the Lone Star state to Kansas City. Give a rustic touch to your garden with this wooden wagon wheel trellis from Birch Lane. Made from cedar, it is resistant to rot, mildew, and will weather to a soft gray, making it perfect for outdoor use. It will afford you many years of service while supporting your favorite vines. Bring an aura of yesteryear to your yard, garden, patio or even to an inside wall. This pair of wooden wagon wheels is made of weather resistant materials enabling their placement anywhere you desire to add a touch of the wild west. Brought to you from Pier Surplus, they are the perfect rustic touch. Decorate a wall with this pair of graduated wagon wheels, one large and one small. They are exquisitely detailed, including a metal rim. Put them anywhere, indoors or out. The wood is treated to be weather resistant and will offer many years of viewing pleasure. This décor item comes to you from Pier Surplus, a rapidly growing company providing garden decoration. The distressed metal rim wheel from Williston Forge features bicycle spokes, red paint with distressing, and a silver center ornament. A hanging tab is attached to the back to make it easy to hang. It can be displayed indoors or out, according to your decorator needs and inspiration. Ideal for blending with any country or western décor, this wagon wheel is unfinished for you to stain or paint in accordance with your colors and theme. The thick outer rim is supported by fat wooden spokes and an unadorned wooden center. With the right treatment and finish, it could be displayed out of doors but will work very well inside. This wooden wagon wheel, with its tapered spokes and charred walnut finish, is perfect to use as a wall decoration or to support lights as a chandelier. Predrilled with holes for hanging or for wall mounting. Intended for indoor use, only. It is not weather resistant. This replica wagon wheel is accompanied by an attached textured cactus, saddle, boots, lariat, hat and olla jar, reminiscent of the Spanish Caballeros from old Mexico. Manufactured in China, it comes ready for hanging. Primarily designed as interior décor. Order this bundle of twelve wagon wheel decorations for your next Wild West party or event. Measuring about eleven inches across and made from plastic, they are perfect for the soiree celebrating a rodeo or a big cattle sale. Or you could use them to dress up the square dance floor at your next social dance event. Easy to put up or take down, and store for the next party time. A reminder that the wild west of the United States was not the only culture driven by wagon wheels, this beautiful tapestry displays colorful wheels leaned against a wall along with a colorful scattering of leaves. One-sided print on quality fabric will brighten any wall inside your home.